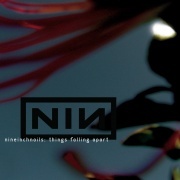 Things Falling Apart (also known as Halo 16), released on November 21, 2000, is described as a collection of "various manipulations of songs recorded from The Fragile sessions." An official website was set up for its release. A two-track promotional version of Into The Void was released in the US and was incorrectly labeled as Halo 16. Previous release - "We're In This Together" Halo number: 16 Next release - "And All That Could Have Been and Still"
This page was last modified on 4 April 2019, at 22:42. This page has been accessed 181,747 times.